Ambient Occlusion is a camera effect that can be enabled on the Default Camera or any Camera Entity added to a 3D Document. Ambient Occlusion is a shading and rendering technique used to approximate how exposed each point in a scene is to ambient lighting. It darkens creases, holes, intersections and surfaces that are close to each other. In real life, these areas tend to block or occlude ambient light, therefore they appear darker. In the above example, we have entered high or strong values to illustrate the effect. In normal circumstances, you would use lower settings to apply a subtle effect. DriveWorks uses SSAO (Screen Space Ambient Occlusion) to calculate the ambient occlusion effect. For every pixel on the screen, DriveWorks will sample the depth values around the current pixel and tries to approximate the amount of occlusion from each point. The occlusion amount depends on a number of factors, exponent, falloff depth, radius and intensity. With a Node selected and the Camera Entity added to the Node, the following will be displayed in the Information Panel. 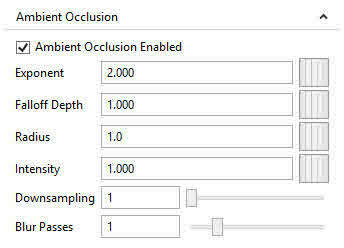 Enable and disable Ambient Occlusion on the Camera Entity. Disabling ambient occlusion means it won't be shown on this Camera Entity. TRUE enables the effect, FALSE disables it. Increasing this value has the effect of making the Ambient Occlusion darker. Darker sections of the model will get darker faster than light areas. You can think of this as Ambient Occlusion contrast. Falloff Depth determines how close two surfaces need to be to cause an occlusion effect.. A lower value means that the two surfaces have to be really close together to apply Ambient Occlusion darkening. A larger value means that the two surfaces can be further apart. This is the distance between samples on the actual image. A higher value means that the pixel will look further away for surfaces that will darken it. Increasing this value has the effect of smoothing out the Ambient Occlusion effect. Intensity is a flat multiplier on the Ambient Occlusion effect. Increasing this value makes everything darker equally. This is unlike Exponent which effects the darkening curve. Ambient Occlusion creates a texture and applies it to the final rendered image. Downsampling controls the size of this texture. Lower values are less performant because it creates a higher resolution image but produces higher quality renders. Higher values are more performant but reduce the final render quality. Ambient Occlusion performs blur passes to smooth the Ambient Occlusion effect. Low values create a noisy effect, higher values smooth that out. Lower values have better performance, higher values have less. By default, the Camera Entity will use the 3D Document's Default Camera settings. If Ambient Occlusion is enabled on the default camera then it will be enabled on the Camera Entity. Likewise, if Ambient Occlusion is disabled on the default camera, it will be disabled on the Camera Entity. Select the Node with the Camera Entity applied. In the property panel or rules panel, set Override Default Camera Effects to be TRUE. With this property set to TRUE, you can now enable Ambient Occlusion. 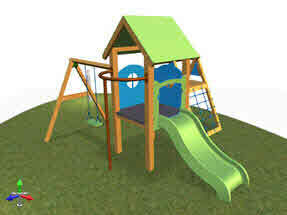 Set the property Ambient Occlusion Enabled to be TRUE. Ambient Occlusion will not be visible in a 3D Document while in edit mode. To preview the Ambient Occlusion Camera Effect, you must enter Preview Mode. Preview Mode can be found on the Command Bar in a 3D Document. Preview Mode will hide the 3D Document triads, hide wireframe selections, show Camera entities and enable any Camera effects.